I didn't take this picture. I think my dad did, or possibly my mom. 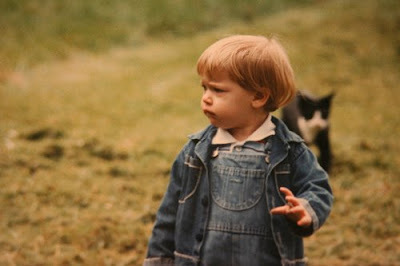 That is me at about 2 years old. That cat behind me? My sister named it Potty. I've always loved this picture, I wonder what I was so worried about. I mean, what exactly does a two year old worry about? That's a great photo! The expression really sells it. I hope you have that framed somewhere. You don't look worried, you just have that intense, curious, thoughtful "child" look on your face. It's a really cute picture! What a fabulous picture! something is definitely going on! Hello you are obviously worried about "Potty" hahahahaha you were a cute little kiddo!